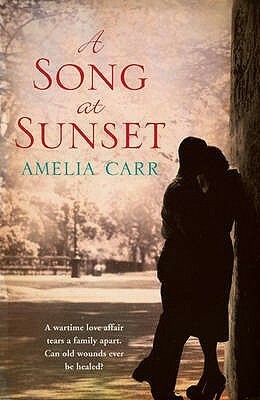 A Song at Sunset by Amelia Carr – It's Time to Read! When the Second World War breaks out, Carrie Chapman rebels against her controlling husband to work at a local hospital. Amidst the chaos of the Bristol blitz, Carrie finds herself falling in love with a young doctor, Dev. Carrie’s willing to defy convention and leave her stifling marriage for Dev, but one summer evening, horrific events change Carrie’s life for ever. Since that night, for forty years, Carrie’s beloved daughter, Gillian, has refused to see or speak to her. Now, someone is digging into the past. Will Carrie break her long silence and, if she does, will Gillian finally be able to forgive? I picked up this book because Amazon kept putting it into my recommendations – and I was pleased I did pick it! Amazon got it right! This is the story of Carrie, a girl who before WW1 falls pregnant out of wedlock and has to marry the father Frank. At first it is fine, she thinks she is in love, but when she loses the baby she realises she wasn’t. Frank is demanding and seemingly uncaring and they are not happy together. Carrie doesn’t know what love is until she meets Dev, a doctor at the hospital she works at during WW1. She tells Frank she is leaving him but later that day he has an accident and loses his leg. She is guilt-ridden, convinced it is her fault, so she stays with him. They have Gillian but Frank’s moods get worse over the years, as does his violence towards Carrie. Then one night Frank ends up dead and Carrie goes to prison for it. Gillian goes to live with her aunt Lizzy, Frank’s sister – who turns her against Carrie. Gillian never sees Carrie again, or her sister Andrea. For many years Andrea has been writing to Gillian, trying to persuade her to see Carrie again. Gillian puts the letters away, but they are found by Kathryn, Gillian’s daughter. With troubles of her own, Kathryn decides to go see Carrie. Can she find out what happened to make Gillian hate Carrie so much? I was immediately drawn into this book. The book I read before, Wicked, was long and drawn out but this book wasn’t like that at all. The story was interesting from page one and I read this quickly because it held my interest. It is a great story, with lots of twists and turns. But the last 50 pages I had worked out what happened but I did have to go through all the other options to get there! This is a big book – over 500 pages, but it read so fast! This book had it all in my opinion. There is love, history, murder and mystery. I really enjoyed this story. I really liked the characters. I love a book where I am interested in the characters and want to know the outcomes of their lives. I wasn’t sure what I was going to think of Carrie – a woman who went to prison for manslaughter – but I loved her! As an older woman she was kind and caring. She had given up her life to protect someone and was still holding on to that secret. As a young woman she tries to be honest and a good wife to a man who doesn’t love her. I thought Andrea was great. I thought it was brilliant that 40 years on she was still flustered by the man who she had a crush on when she was teenager! I was so disappointed in Frank. He started like a kind gentleman – coming to Carrie’s aid when she had a puncture on her bike down a country lane, and then pursuing her but the longer they were married the more jealous and controlling her became – even before Dev came into the picture. Maybe his attitude was what pushed her towards Dev? It was such a shame that Frank turned into a monster – an angry man who hurt his family. This book wasn’t written how I was expecting it to be. Most books that jump around in time start each chapters with the date at the top of each chapter but in this book, we are in this year but floating into the past through Carrie’s memories. It is a seamless transition into the past, which doesn’t leave you confused but draws you in. I’ve rated this 4 out of 5 because I thought this was a fabulous story that was full of life, excitement and mystery. I was guessing most of the way through this book but loved reading how the past unfolded. This is so easy to read and it kept me engaged all the way through. This is a great book!